There’s nothing better than the instant torque of an electric motor. Could with the all-wheel drive of a Tesla Model X, and you have a proper pulling machine. YouTube user Bjørn Nyland found this out when he attempted to tow a 95,000lb truck over the nasty conditions of snow and ice. The truck was set to neutral and the dual motor Model X P90D took to the haul with Nereus NS806 studless tires struggling to grip the frictionless surface. To our surprise, the car actually managed to pull the Goliath-like truck and was perfectly able to keep at it once the truck had gained momentum. 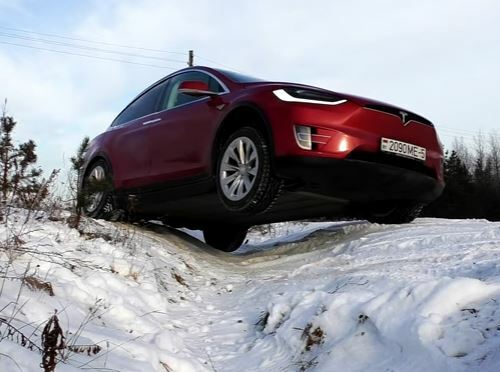 We’re sure the tyres helped massively, however, as did the heroic all-wheel drive system and instant torque of the Model X. Take from this what you will, but know that the Model X isn’t just a city crawler. It has some real ability behind its soft looks.